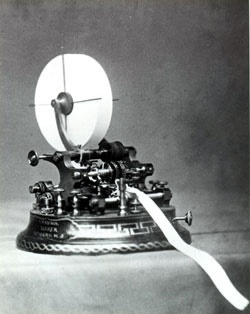 Once Edison had marketed his first successful invention-a stock ticker and printer- for $40,000. I'm confused. Are stock ticker and printer two different machines or just one? You mean it's a single machine? Do you know how to use a search engine for research, sundarnaz? Yes I know. I Googled this phrase or word, whateve it is, before posting it hear. It showed results about Edison and etc. I got no idea. sundarnaz I got no idea. You need to try harder. I found plenty of information. That search offers about 397,000 results. I just hit upon the idea that it probably a single machine because the word "invention" is used. If they were two machines it would be "inventions". Am I right? That's a logical conclusion, yes! One Or Two As(Es) :)? Two Subjects: One Alive, One Dead...?